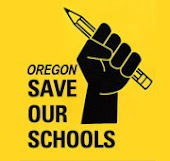 Oregonian writer Betsy Hammond apparently didn’t get the message widely broadcast by state education officials and Governor Kitzhaber. They promised the federal No Child Left Behind (NCLB) waiver would make everything sooo much better, offering more “flexibility” for our schools. No more using narrow achievement testing for high stakes decisions like labeling kids, schools and teachers as “failures” based on narrow test scores. But what has happened? Hammond’s story, “New ratings, similar results” (8/4/12) is all about Oregon’s blind acquiescence to the US Department of Education’s wrong-headed testing mania. First, Hammond’s front page sub-heading totally misleads the reader. The heading says the state now “evaluates schools on students’ academic growth rather than test results.” But what measures does the state now use to measure “growth”? Answer: narrow reading and math test scores! We’re also still ranking schools just like the good old days! Here are phrases from Hammond’s article: “schools that failed,” “rock-bottom test scores;” and “worst and “second worst” schools The “worst” have shiny new labels slapped on: “focus schools” and “priority schools” Hey, we’ll even have some “model schools” who will tell the poor “failing schools” just what to do! How were the “model schools” determined? Narrow test scores in reading and math! A groundswell of angry Oregon parents see their schools forced to spend up to a full month out of the shortened school year on testing. They’re tired of the state taking control over narrowing and removing any semblance of local control over curriculum and teaching. We are all tired of the state’s pseudo-scientist consultants who willingly ignore Oregon’s decade of disinvestment in our public schools. Instead, the Oregon Education Investment Board spends countless hours hearing these hired consultants rhapsodize over eye-glazing terms like “standardized formative assessments,“ “projecting trajectories” and “longitudinal data systems.” Cutting through this obtuse language, by the way, reveals that their new data systems will violate children’s privacy rights. Here are steps we can all take. Parents have the right to opt out of having their children tested. They can tell legislators and the Governor’s hired guns, “my kid is not a test score!” They have the right to tell the bureaucrats that they will not allow their child’s “data” being shared widely with researchers and accountability mavens without their consent. Everyone can lobby the Governor and legislature to stop this top-down accountability craziness, and begin re-investing in public education, and return control over teaching and learning to where it belongs--our locally elected boards and educators. Tom Olson is a Canby grandparent and a founding member of Oregon Save Our Schools, a grass roots advocacy group for children.